Sounds easy yeah? It has also one big advantage - you will use same hardware for programming and normal operation of PIC18F2550 with PC, too. It really kills two birds with one stone. There is only 1 big problem. Your chip bought in shop is virgin without any software inside – it is empty. That means it’s without USB bootloader software inside! Unfortunately you need another type of programmer to get USB bootloader into your virgin PIC18F2550. To overcome this problem see next 2 available programmers on this web site. Another disadvantage of this simple USB programmer is that there cannot be used any FW downloaded from internet in your PIC. That’s because bootloader occupies part of PIC’s memory and user FW is placed by bootloader behind area used by bootloader. They are used to indicate if USB programmer is powered. They are not mandatory, you can omit them. PGM pin may activate ISP programming mode when LVP configuration bit is enabled. It’s better to connect it down to ground to enable run. Symptom may be that your computer does not detect USB HID bootloader and device looks like not connected (because PIC does not start bootloader). Prevents from unpredictable USB bootloader activation. There are several schemes that are not using this capacitor. Omitting this capacitor may lead to PIC instability on my experiences. USB bootloader behaves strange – symptom is that USB device in Windows is still disconnecting and reconnecting. On my experiences, using external power (not USB +5V) will not help to omit this capacitor. I had two PIC18F2550 and one was working OK, other one was still “detaching in Windows”. You can see several articles discussing other values. Values according to PIC18F2455 / 2550 / 4455 / 4550 Data sheet are working. May cause PIC’s instability. Some schemes are using 220nF value, but several forums are discussing higher values, somewhere I saw recommended 470nF. Unfortunately I do not have had such a capacitor, so I have used 2,2uF capacitor from my inventories. As you can see I have used simple wire as JP bootloader jumper. I have decided to use Microchip’s USB HID bootloader which is for free. There is USB HID FW update tool for Windows available. 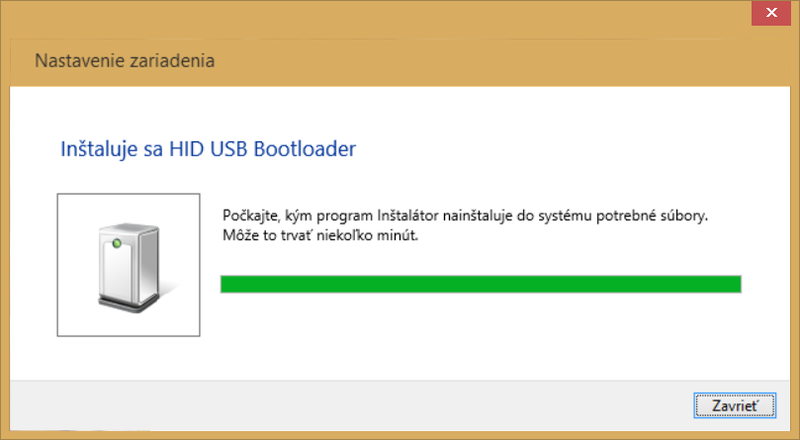 Because bootloader uses USB HID standard, there is not needed to use special USB driver. Windows uses its standard HID drivers, what is beneficial. There are only signed drivers are allowed in Windows 8 standard operation mode. So it’s easy to use. It uses LED on D port which is not available on 18F2550, but this does not limit to use it for PIC18F2550. microchip_solutions_v2013-06-15\USB\Device - Bootloaders\HID\Software Windows Executable\ There you can find version 2.9j, but I like version 2.6a more (like another users of PIC18 USB Bootloaders ). USB HID bootloader FW has to be in your PIC18F2550. 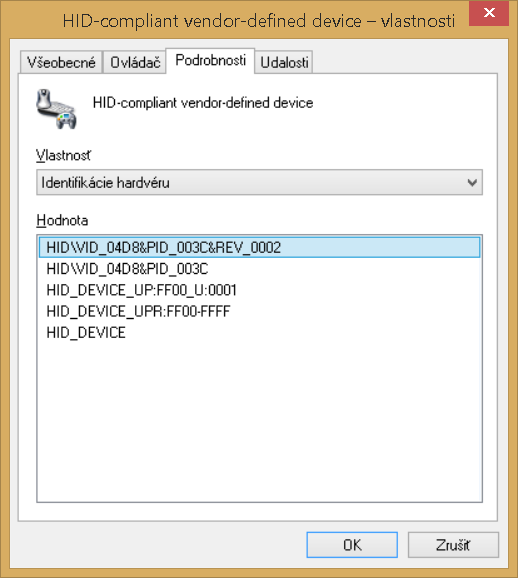 In device manager we can see new hardware. In hardware properties we can see PIC's Vendor ID 0x04D8 and Device ID 0x003C. Open Hex File you would like to load into PIC. This will enable Program and Verify buttons. Program/Verify your file into PIC. Microchip USB HID Bootloader v2.6a - erasing This will enable Program and Verify buttons. 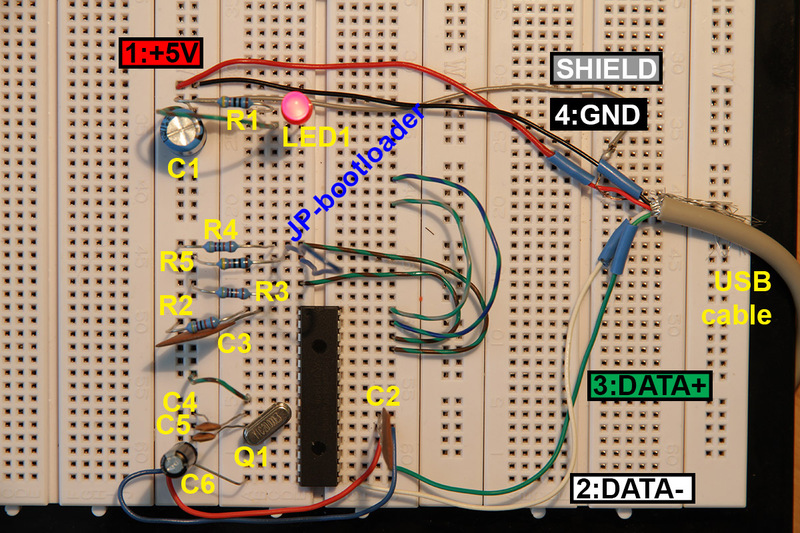 Microchip USB HID Bootloader v2.6a - verifying This will enable Program and Verify buttons. Microchip USB HID Bootloader v2.6a - Erase/Program/Verify Completed Successfully This will enable Program and Verify buttons. USB HID programmer schematics in PDF. 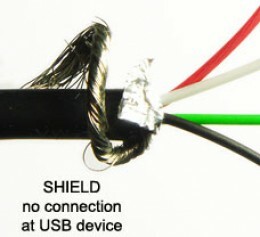 For more information about FW development uploadable by USB HID bootloader see section USB bootloader. You can find many other programming SWs (that are designed for particular bootloader). Programmer has to work with PIC18F2455 which has 24kB FLASH comparing to PIC18F2550’s 32kB FLASH. So this is Simple HID bootloader based USB port programmer for PIC18F2550 or PIC18F2455.